The Nagoya Players in central Japan have been producing English theatre for 36 years. 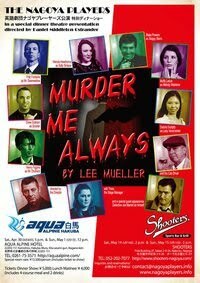 I am very honored that they have chosen "Murder Me Always" to kick off their 2011 Spring Season. I was contacted by Daniel Ostrander in January of this passed year about obtaining the rights for the play, which was well before Japan suffered from the earthquake and tsunami and I really wasn't certain they would go ahead with production, but a note on Facebook later confirmed, they were determined to press on. "Murder Me Always" has been around the world a few times and even spent a month at "The Laugh Factory" on West 42nd Street in New York - so I could almost claim, it played "off Broadway". It's funny to think that this was the first "murder mystery" script I ever wrote and it was essentially a reaction to suffering as an actor in very bad murder mystery at the time. It took me just under a week to knock out the first draft of the script. I had written several "non-mystery" one-acts that had been produced locally, but this was the first attempt to write a play within a certain niche. I was surprised it came to me so easily. I must admit there is something about planting your tongue firmly in your cheek that helps the words pour out on the page. My biggest fear was - would anyone else find it funny? Would they find it entertaining? Was my humor too esoteric? Were most "murder-mystery-dinner-theatre" audiences too accustomed to low brow innuendo, grade school puns and paint by number plots? Would they accept this new playwright influenced by British Humor, Woody Allen and Kurt Vonnegut? Yea, OK, I guess.. maybe so. After all, the play is premiering on the other side of the world in Japan now. I've been accepted.